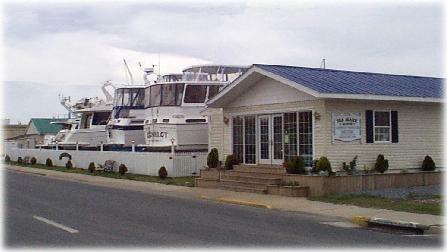 Sea Mark Marine and Crisfield Propeller are both family owned and operated businesses located at 822 West Main Street in the town of Crisfield, Maryland. The Family has been in the Marine Business over 50 years and continues to repair and service all types of Pleasure and Work boats on the Bay. Customizing is our specialty, repairing or rigging your boat the way you what it. Our facility is located on the Little Annemessex River, just of the Tangier Sound making it easy to lift your rig with our 50 ton travelift. Somers Cove Marina is within walking distance of the shipyard. Several restaurants, shops and stores are nearby if you are in transit. All of the work is done on premises by highly qualified marine specialists. In the fall of the year many of the Famous Chesapeake Bay Skipjacks are painted and repaired in this yard. ............ President Sea Mark Marine, Inc.